Points from last month’s editorial and a couple of conversations at Readercon inspired me to go on another data mining expedition. I started digging into the genre data—which the authors provide on submissions—to take a look at possible trends. The data isn’t specific to themes within a genre, but that wasn’t what I was after this time around. I was looking for data to indicate whether or not a specific life event—my 2012 heart attack—had caused a concrete and permanent change in my taste in fiction, and if so, should the submissions guidelines be changed. My heart attack happened in July 2012, which places it at issue 70, very close to the halfway mark in Clarkesworld’s history. However, in terms of stories published, that’s somewhat misleading. Up through issue 60, we only published two original stories per issue. Issues 61-70 had three stories in each and starting at 95, there were four stories in every other issue. From 100 on, we’ve typically featured five. To further complicate things, we’ve more recently switched from a story count to a word count model. This change has allowed us to be a bit more flexible in publishing longer works, but has made the total number of stories per issue more variable. 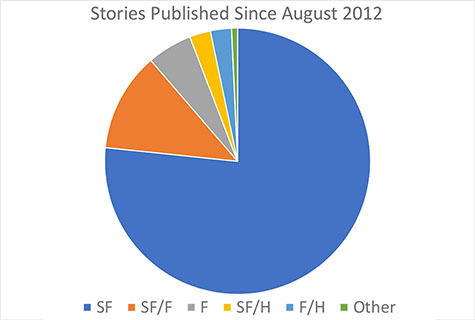 As you can see, approximately 77% of the stories we’ve published since then are categorized as science fiction by their authors and a bit more than half of what remained are science fiction/fantasy hybrids. Fantasy came in next and was followed by horror blendings with science fiction and fantasy—combined to roughly the same amount as fantasy. The tiny sliver of “other” leans much more SF than anything else (by my opinion, the authors call them a variety of subgenres). What’s missing? Horror. And now we get to the point of my digging through the data. Since my heart attack, I’ve felt like there’s been a disconnect with my ability to engage with that specific genre. I’ve had my own personal horror, and it appears to have put me off the fictional ones. I don’t like to go there anymore. Yes, there are still some dark SF and dark fantasy pieces—and a lot of heavier themes—still making their way into the magazine, but it looks like I have drawn a line in the sand. Prior to June 2012, Clarkesworld published some horror, but the data set is so much smaller that a single story has a much more significant impact on the percentages. I could go on about the margin of error and other things, but it would still be visually misleading—and as I’ve found in the past, subject to people reading their own biases into the results. There’s enough armchair statisticians using bad math to score points and fuel causes. Why would I want to contribute to that? The more I thought about it, the more I came to the realization that the “why” question I was asking myself was completely irrelevant. The history in this context doesn’t matter. What matters is what I am doing now and what I intend to do in the future. There’s nothing wrong with admitting that I’ve lost interest in the horror genre. There’s no shame in feeling that way and there’s nothing stopping me from changing my mind again at some later date. It’s more important that I be honest with myself, our readers, and the authors submitting their work to Clarkesworld. Effective today, we’re changing our submissions guidelines to remove horror from the list of genres we accept. Given the last six years, that shouldn’t come as a surprise to anyone, but it’s time to make it official. Such an interesting (and honest) analysis. Thanks for the heads up about dropping horror. Need to delete the "needed to"
I understand how it feels to fall out of love for a genre that once captured your heart. It's okay to admit to that. Sometimes, it seems no one is trying to make a story out of love or even fun. Sometimes it feels a little repetitive like no one wants to try something new or at least take an old concept and add some spin to it. If it were a story made out of love, you would've been captured by the visual and imaginary of the characters and the setting showing you. You would be entertained by the story because you enjoy it! Yet, sometimes, even a story made out love can also not captured the reader no matter how good it is. Science Fiction has sort of not captured my interest anymore; it becomes more convoluted when it comes to storytelling and visual. And I'm not even talking about Diversity! I'm a latina, I support it wholeheartedly, and we need more diverse characters from all walks of life! Where is the passion for storytelling? Where's the adventure? The action? The romance? The horror? The drama? It's like there's nothing to write anymore. When it comes to Sci-fi, It seems to focus more on the "reality" and trying to make edgy storytelling with its edgy protagonist, edgy white-boy hero-ing with the personality of a paper bag, a thing. And it's not just Sci-fi and Horror, even Fantasy has become a little redundant lately. As I said before, regardless of the fiction is great, some people don't feel the passion in their hearts to read it anymore. So don't worry. We all at some point fall out of love of a genre. It happens to everyone, sometimes people never have the love of the genre again, that is okay. Sometimes it does return, and when it does, it comes at you like a vengeance. That's okay too. You also even enjoy a new genre you never thought you'de ever like. I wish you and the magazine the greatest of luck! Please allow yourself to take a break and enjoy your time. Take time off and just allow yourself to be. My only comment is that you look a little young to have had a heart attack, especially at 6 years ago! I'd love to pry, but alas I am but an internet stranger--all I can do is wish you good health and hope you are taking care of yourself. Thanks to all for their support! Nice to know that people are behind me on this one.